Railpictures.ca - John F. Bromley photo, Dan Dell'Unto coll. Photo: Twelve brand new H1 subway cars, part of the 164 car order built by Hawker Siddeley Canada for the new Bloor-Danforth subway line (opening early next year) sit together at the south end of the TTC’s new Greenwood Subway yards on a Summer evening in July of 1965. The TTC had been taking delivery of the new cars from HSC’s old Canadian Car & Foundry plant in Thunder Bay via flatcar since May, starting with the first two cars 5336 and 5337 delivered to Davisville Yard while Greenwood Yard was still under construction, and the rest of the order to 5499 via Greenwood – seen here up to the 5360-series deliveries. Greenwood was constructed in the early-mid 60′s in conjunction with construction of the new B-D subway line, in order to service and store the large fleet needed to operate the new east-west route. Noted in the yard in the foreground are H1 cars 5361 & 5362 (not the proper final mated pair*). Lined up on the left is home-made tunnel clearance car RT-11, and H1′s 5367-66-69-68-57-60 grouped together. The two car pair near the back of the yard is 5349-48. Two new deliveries from CN are also visible: 5363 riding on a CP 313000-series flatcar in the background waiting for her turn to be spotted and unloaded, and 5364 on another flatcar spotted in the “pit” ready for unloading. The pit track consisted of the railway-gauge siding track dead-ending in a depressed area, with a section of TTC-gauge track running level with the flatcar deck for wheeling subway cars off and into the yard using a car mover/trackmobile. There was another railway-gauge track nearby, the far right track, that had an overlapping dual-gauge section (perhaps for delivery of track supplies into the yard). New subway cars were delivered into the property via a railway spur running off CN’s Kingston Sub into the back of Greenwood. At this time Greenwood was busy taking delivery of new cars, but still under construction and not yet fully operational (yard tracks were still being laid when the first two H1′s were delivered to Davisville in early May 1965). Most of the track appears in place now, but one can see dug-up trenches in the yard, reels holding cable to be laid, fresh ballast spread around and piles stockpiled on the far right. The bright red elevated platforms are fire towers for easier access to any fires or incidents that may arise in the yard, a feature still present today. John F. Bromley photo, Dan Dell’Unto collection slide scan. *(Note: proper mated “A + B” pairs would be cars with numbers ending in 0-1, 2-3, 4-5, 6-7 and 8-9 mated together. Thus, 5360-5361, 5362-5363, etc). | Railpictures.ca – Canadian Railway Photography – photographie ferroviaire Canadienne. Caption: Twelve brand new H1 subway cars, part of the 164 car order built by Hawker Siddeley Canada for the new Bloor-Danforth subway line (opening early next year) sit together at the south end of the TTC's new Greenwood Subway yards on a Summer evening in July of 1965. The TTC had been taking delivery of the new cars from HSC's old Canadian Car & Foundry plant in Thunder Bay via flatcar since May, starting with the first two cars 5336 and 5337 delivered to Davisville Yard while Greenwood Yard was still under construction, and the rest of the order to 5499 via Greenwood - seen here up to the 5360-series deliveries. Greenwood was constructed in the early-mid 60's in conjunction with construction of the new B-D subway line, in order to service and store the large fleet needed to operate the new east-west route. Noted in the yard in the foreground are H1 cars 5361 & 5362 (not the proper final mated pair*). Lined up on the left is home-made tunnel clearance car RT-11, and H1's 5367-66-69-68-57-60 grouped together. The two car pair near the back of the yard is 5349-48. Two new deliveries from CN are also visible: 5363 riding on a CP 313000-series flatcar in the background waiting for her turn to be spotted and unloaded, and 5364 on another flatcar spotted in the "pit" ready for unloading. The pit track consisted of the railway-gauge siding track dead-ending in a depressed area, with a section of TTC-gauge track running level with the flatcar deck for wheeling subway cars off and into the yard using a car mover/trackmobile. There was another railway-gauge track nearby, the far right track, that had an overlapping dual-gauge section (perhaps for delivery of track supplies into the yard). New subway cars were delivered into the property via a railway spur running off CN's Kingston Sub into the back of Greenwood. 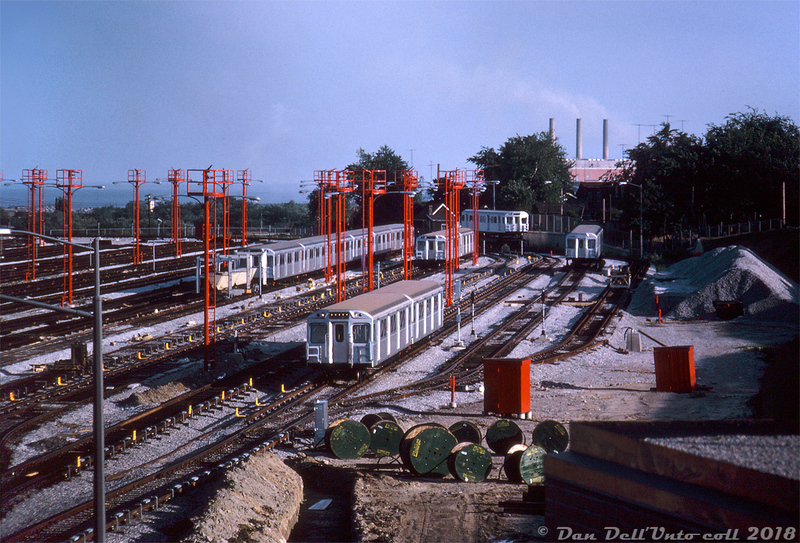 At this time Greenwood was busy taking delivery of new cars, but still under construction and not yet fully operational (yard tracks were still being laid when the first two H1's were delivered to Davisville in early May 1965). Most of the track appears in place now, but one can see dug-up trenches in the yard, reels holding cable to be laid, fresh ballast spread around and piles stockpiled on the far right. The bright red elevated platforms are fire towers for easier access to any fires or incidents that may arise in the yard, a feature still present today. And the three smokestacks in the background mark the Richard L. Hearn Generation Station in the Toronto Portlands. John F. Bromley photo, Dan Dell'Unto collection slide scan. *(Note: proper mated "A + B" pairs would be cars with numbers ending in 0-1, 2-3, 4-5, 6-7 and 8-9 mated together. Thus, 5360-5361, 5362-5363, etc).